Matt is not exactly enjoying his first training tour. For two weeks he gets a break from his textbooks and the Airship Academy in Paris where he is a student. But, the ship he is on, the Flotsam, is not quite what he had hoped for. With a difficult Captain and a ship which should by rights be grounded because of its condition, it is not a comfortable journey. Then, as they fight their way through a terrible storm system called the Fist, the crew of the Flotsam see a ship in the skies far above them. Who can be flying at such an elevation, at such a height it would be freezing cold and hard to breath. When they climb higher to investigate, the crew of the Flotsam is amazed to discover that the ship is none other than the Hyperion, a fantastic airship which disappeared forty years ago. An eccentric and brilliant inventor, Grunel, loaded his entire life on the ship including, it is rumored, stacks of gold and other treasure. Then, on its maiden voyage, the ship disappeared. Since then some people have said that they saw the Hyperion flying in the sky far above usual airship cruising altitude but none of the rumors have been confirmed - until now. The Flotsam is no match for the extreme height and the storm and has to retreat but Matt cannot help hoping he is going to get another chance to see and perhaps explore the Hyperion. His wish comes true a lot sooner than he expected for his friend - and sometimes more than friend - Kate de Vries is eager to go after the Hyperion. With plenty of money at her disposal, Kate soon has a ship, the Sagarmatha, and a captain and his crew lined up. It is decided that Matt, who knows the last known coordinates of the Hyperion, and Nadira, a gypsy girl with a mysterious past, will join the expedition. What Kate is interested in is a zoological collection which Grunel was said to have loaded onto the Hyperion. Matt, Nadira and the Captain of the Sagarmatha, have a more basic interest in the ship - the gold. There are others who are interested in the Hyperion and soon Sagarmatha is racing across the skies, her passengers fervently hoping that they will find the Hyperion first. It is going to be a dangerous business for the Hyperion is flying very high at an altitude most airships cannot manage and few people can survive. Matt and his fellow adventurers are going to have to be very careful if they are going to succeed in their salvage operation. What follows is an exciting series of events full of surprises and unexpected dangers. It would appear that the high altitudes are not as lifeless as people first thought. Huge predators stalk the skies looking for prey and they are a force to be reckoned with as Matt, Kate and the others find and explore the Hyperion. How many secrets lie in the icy airship, and where did Grunel hide his famous gold? In this fascinating and gripping sequel to "Airborn" we once again meet Matt who is still trying to find his place in the world and who believes that gold will solve all his problems. 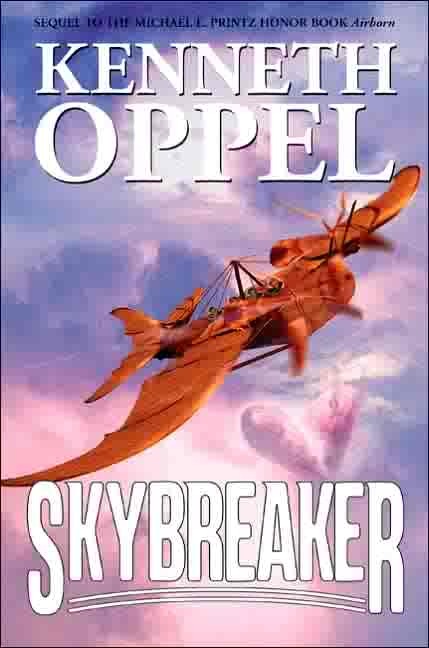 More than anything he wants to be an airship captain and now he discovers that in addition, he wants to have Kate de Vries for his own. Will she take him if he is without money and good prospects? High in the freezing sky, struggling to breath, Matt tries to come to terms with his feelings, his hopes and his dreams - and he tries to stay alive.